I was at the hairdresser today, which is my fount of local gossip. Apparently some woman from "somewhere near New York City" (that needs to be said with a hollow laugh) has moved in locally. She came into the salon in a state of shock, saying that woodchucks had eaten all her flowers. "Welcome to Western New York!" said the gals. There followed an exchange of horror stories of which mine were, though I say it myself, some of the most exciting. Take the blueberries. One year every single last one was gobbled up by turkeys. The following year, every single last one was devoured by chipmunks. This year, the sweet little rhododendrons I had been nurturing for a couple of years (special offer from Home Depot at 4 dollars each) have been eaten by deer. And to think they'd just started growing! That's the fun of living here; you never know what to expect. Someone will always find something you haven't put a net around. Can a rhododendron survive without leaves? The hairdresser thought maybe. In my usual exhibition of the triumph of hope over experience, I'd been out to buy another one, checking first that it was hardy to minus 25F. (Yes F, not C). So much I have learned. "At least it wasn't bears", said the salon gals. Uh Oh. This is a deer hoofprint (see previous) It seems to be headed for my garden. Meanwhile butter wouldn't melt in someone's mouth. Tell that to the birds... I wish I was relaxed enough to fall asleep in a tree. And in the flowerbeds, things are up and running at last. About time. Early spring morning on our lane - the air is still crisp, the sky powder-blue with Winnie-the-Pooh clouds. It's still the lull before the lawnmowers and you can hear every bird in the county chirping, two-tone tweeting, knocking on wood. Geese flying, honking happily, above. On the lake, shimmering, silver water. Still bare, brown trees interspersed with feathery hemlock. A slight hint of red in the trees means the maples will soon be in leaf. After last night's rain the stream is chattering. And the grey grass has suddenly turned green. A faint scent of pine in the air, deer hoofprints in the mud, the roadside periwinkle in bloom and a mourning dove sits in a tree. But in the fog this morning, the usual Western New York thing of people driving without lights. Especially if they've got a grey car. You take your life in your hands. I passed up another puddle-jumping experience and hitched a lift with hubby. It meant a circuitous country route to go back via Bradford Regional Airport to pick up my car. There were still no planes there. But on the way we stopped at a rest area we hadn't seen before, with something to cheer it up. The Senecas on our local reservation are these days known mainly for a large, ugly casino that just keeps on growing and exploiting the simple-minded and for holding up repairs to the motorway that runs through their land, which is why it has so many potholes. They deserve better. It's cold but they're a couple of weeks ahead of us. I just couldn't get enough of it. No need for words. Inside the little terminal building was, unbelievably, a United Airlines desk and a charming young man who took my boarding pass and looked at my driving licence (as they do in America), plus three smiling people from the Transportation Security Administration, in their natty blue shirts, all looking delighted to see a passenger. Classical music played solemnly and the young man invited me to sit and wait in the lounge, which was a perfect airport lounge in miniature, or go to the restaurant, which, he told me, was around the corner. I elected for the latter, hoping for a cup of coffee and it was a surprisingly large restaurant for such a tiny airport, the tables laid with proper linen napkins and a large map of the world on the wall. The music had changed to a sort of pop and country-and-western mix. I felt I had strayed into some old film about the days when flying was actually a pleasure. I sat, drinking my coffee, which the waitress kept topping up (in between avidly polishing the already immaculate window sills) and looking out of the picture windows onto the airport tarmac, wondering if the restaurant would have any other customers, indeed whether it had ever had any other customers. Perhaps local people came to eat here and combine it with some plane-spotting. But there was one drawback to that. I still couldn't see a plane. I was slightly disconcerted. With the country in a state of alert, all sorts of interesting scenarios went through my mind. Or was it perhaps meant for me? Would I actually get the chance to ride in a helicopter? But no, that was not to be. The helicopter's crew did nothing more exciting than get in a minibus and drive off, the driver giving a cheerful wave as he went past. I resumed my crossword. Then, a few minutes later, the charming young man, evidently the airport's jack-of-all-trades, emerged carrying a couple of batons. My spirits lifted. Because, unless he was bent on some juggling practice to alleviate the boredom, that could surely mean only one thing. And wonder of wonders, there it was. The eagle had landed. But that was far from being the end of my adventure. I was flying to Columbus, Ohio, for a family celebration. Hubby had already driven down there on business and suggested I might hop on a plane at Bradford, just over the border into Pennsylvania, change at Cleveland and then on to Columbus and meet him there. I'd never heard of a Bradford Airport, Bradford itself being a down-at-heel town whose main claim to fame is the Zippo cigarette lighter factory. Still, I was game for an adventure. I made my reservations and this morning, I set off. It did not start auspiciously. For the first few miles on New York roads, I was convinced I had a flat tyre, as the car bumped and bounced along. I decided to ignore it and hope it would go away. But then, as usual, into Pennsylvania and the bumping stopped. I breathed a sight of relief. My next moment of panic came as I drove down the highway, past Bradford and into the depths of the countryside and not an airport in sight. I went through tiny villages clinging to the hills, old rusty oil wells, a town with about three houses called Custer City which sounded as though it had strayed from the Wild West. An enormous turkey crossed the road in front of me and a sign said "Allegheny National Forest." This had scattered rocks, spectacular views and allegedly, a herd of elk but still no airport. A truck pulling one of those prefabricated houses, still in its wrapping, went by the other way. Then I finally saw a small unobtrusive sign pointing left. "Bradford Regional Airport" it said. The road was now a lane. I passed a bar with a sign saying "Welcome Hunters" and further on, another, saying, "Correctional Facility". This is politically correct Americanese for prison. It must have been a big place, the formidable metal fence went on for miles. Then, even less encouragingly, a cemetery. My GPS robot, Samantha, announced I should turn left on "Road", Her wits, such as they were, had evidently deserted her. But before I could yell, "Which road?" there it was, a bigger sign but not much bigger.Yup. Bradford Regional Airport. I drove down a track and through some open metal gates and stopped in a small car park. There wasn't a soul about. To the right, was an old brick building that said, "Rides". "Crikey!" I thought, wondering if I'd look a bit silly walking in there with my wheelie bag. Then I looked to the left. Aha! I grabbed my wheelie bag, gritted my teeth and marched towards the entrance. The wind had got up and was howling around my ears. I half expected to trip over a tumbleweed. There was no plane in sight. Friends in Britain sometimes think I live in New England, which is far from the case, though I did visit Boston once, when hubby had some business there. With growing horror, I've been watching the News and realising that we stayed just down the road from the hotel where the first bomb went off. In fact, so far as I can hazily remember, we could easily have stayed there but it was full. I walked past the hotel and across Copley Square several times, doing my tourist thing- old, posh Beacon Hill and the Freedom Trail (I joked about them letting Brits walk it), all that history connected to the American Revolution. How ironic. And hubby used to run marathons. We think we're smug and safe here in our Western New York rural backwater that never makes the News but the world is small and getting smaller. I keep thinking about who who I know in Boston. Who might have been there. You just never know. I sympathise so much as a Londoner - I can remember the years of IRA bombs - Hyde Park, Harrods, the feeling that you never knew where they would strike next, the shock and tears for the innocent victims. Over and over again. The first thing I've thought of - why didn't they get rid of the litter bins, as they did in London? If it's indeed true that the second bomb went off in one. But they wouldn't have thought of it. So far as I know, nothing like this ever happened in modern Boston. There's a lot of violence in America and of course the ghastly, grand gesture of 9/11 but in general they've been spared this sort of dirty, smaller-scale terrorist stuff in their home country, if not in faraway conflict zones. 9/11 changed their perception but I feel that Americans still have, as a nation, an enduring and endearing optimism and faith in humanity's intrinsic goodness. It makes it all the more sad. C'mon - make an effort! It's not that cold! One of the happiest sounds of Western New York early spring and I've heard it at last! It was a couple of days ago when I was out on the porch - the day had got a bit warmer when suddenly, it began. The peeping of the spring peepers, tiny frogs, living through the winter in a semi-frozen state, practically dead and now just emerged from the primordial mud of our neighbour's pond. Their noise is like a million-strong chorus of sleighbells, echoing around the hills. When the trees are bare, when hardly any flowers are out, when the grass is grey and matted and the roads still caked with with salt and grit, the spring peepers are nature's most potent sign of resurrection. And appropriately for the season, they even have crosses marked on their backs (their Latin name is Pseudacris Crucifer). But it's no use trying to spot them. They are as elusive as spirits. Children go down to ponds at early dawn with torches, hoping for a glimpse but in broad daylight, I've never succeeded. I hear an almost deafening sound and follow it. I get close and it stops. Just like that. On mild, spring evenings I call hubby out to the porch, "What a racket out there!" we smile at each other. Back in 1987, when I was a fairly junior reporter for a weekly paper called The Universe, I was sent to Ten Downing Street to interview the Iron Lady. Since the paper had a Catholic and family-oriented ethos, I was supposed to interview her about family values and such like. Downing Street demanded questions in advance and implied I was not to stray from my brief. It was interesting that Thatcher was the first of the party leaders to jump at the chance of being interviewed by Britain's biggest-selling Catholic paper in advance of the general election - when she agreed, the others had to follow suit. When I got into Number Ten, she was sitting, flanked by a press officer and another aide ready to start up a giant tape recorder. I tentatively put my small one on the table. "Would you like coffee?" she asked graciously and added, "I like my coffee black". "Well I like mine white," I smiled, which wasn't true but I thought it might be my last chance to disagree with her. I had a small trick up my sleeve. Left to my own devices, I wouldn't have done it but the editor who'd commissioned the interview, Kieron Moore, (who, in a previous existence, played Vronsky to Vivien Leigh's Anna in the 1940s version of Anna Karenina) had insisted, being a proud Irishman, that I slip in a question about alleged miscarriages of justice against the Guildford Four and the Maguire family, wrongly, as it was to turn out, convicted for roles in IRA bombings. Mentioning them was definitely not in my brief. "They've got families", had been Kieron's there's-an-end to-it argument. I didn't know whose wrath I was more in fear of, the Iron Lady's or his, if I failed in my mission. Anyway, I asked my question and she answered in her stride, if not exactly giving me a scoop. Talking to her, I had the sense of a powerful muscle car in overdrive. When I replayed the interview afterwards, I said to myself, "Why on earth didn't you chip in there - or challenge her there?" On the clinical tape, her voice sounded so gentle. But I knew I could have no more interrupted her than stopped an Exocet missile in full flight. After that, interviewing Labour leader Neil Kinnock and Social Democrat David Owen, was a let down. (Liberal David Steel declined, probably worried he'd be grilled about championing the Abortion Act). Kinnock briefly lost his composure and accused me of interrogating him and Owen fell asleep while I was talking. 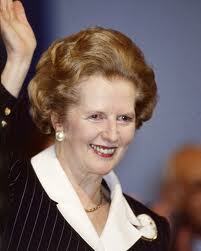 I could easily see why, in her heyday, no one could touch Maggie. I met her again in 2002, at a book launch. She was already a little frail but the spirit was still there. I reminded her of our interview and she professed to remember, though it was probably just good manners. At the start of her speech, Denis was chatting with some friends. She walked over and chided him to be quiet, "I must apologise for my husband!" Sadly, here, in America, most younger people will now only know her through the execrable film, Iron Lady, which dwelt, almost gloatingly, on her descent into dementia. It was an unforgivable intrusion on her privacy and missed so much it could have said about this remarkable person. At least the crocuses have. It's gone some way to cheer me up after the I did a tour of the back garden and realised the deer had stripped my baby rhododendron to its bare bones. I have resorted to the "deer and rabbit repellent" (sic) which is made of dried blood and rotten eggs but a) it probably doesn't work and b) it's shutting the stable door (Americans say "barn door") after the horse has scarpered. Meanwhile at our neighbour's pond, all was quiet. The two fat geese who'd been happily in residence flew off honking in alarm before I had a chance to take their picture. The grass is still in its newly uncovered nakedness state - it's still a while before it'll start shooting up. The weeds will be there first. I can't be the only amateur gardener who puzzles why grass grows so well in flower beds but never in the lawn. As we rolled up the motorways, past Cleveland, Ohio and Erie, Pennsylvania, it grew colder and the wind picked up. Ohio was due for a balmy weekend but we weren't going to be so lucky. And just like those attractions like waxwork museums which give you a little taster at the entrance, we rolled over the border into New York state, "Welcome to New York", and promptly hit a giant pothole. The Western New York motorways, where they exist, are notoriously atrocious. In fact I-86 is so bad that we make a cross-country detour to avoid the endless bump-bump-bump. My neighbours explain that New York City and the Albany politicians couldn't give an xxxx for WNY and its needs. As usual there was a dearth of rest areas, though this one, with a scenic overlook on the frozen Chautauqua Lake was posher than some. A sign pointed out that, in the old days, the frozen lake was used for ice harvesting, which gave winter employment to local farmers. The ice was known for its pure quality and was shipped ("shipped" in the American sense, meaning, in this case, transported by rail) to Buffalo, Pittsburgh and lands beyond. A nice bit of trivia: Chautauqua in the local Indian lingo - or one of them - means Bag Tied in the Middle because that's what its shape is. That is not evident in the photo. But today our teeth were chattering too much. There was hardly anyone there and in the information booth, a lady sat knitting her time away. I would suggest spending the money on more rest areas. Or give this one a nice cafe. To find out what awaited us on our return, watch this space. Another subtle English touch - I also note that the shopping area (below) is called "Town Center" (sic). This is not an expression used much in America. And it's got parking meters. It does not, however, have a Boots or a betting shop. We are staying for Easter Week in a place outside Columbus called Easton, with apartments supposedly based on London's Regency terraces, offering an "Old English" lifestyle. They are a little like Potemkin villages; the backs are not so salubrious. (This might well be the last bit of snow left in Ohio). And if you look too closely at the fronts, they're not exactly up to Nash's standards. But never mind, the door is almost like Number Ten's. Across the road is something even more extraordinary, according to someone we met, the second most profitable shopping mall in the Mid-west. This may or may not be true but I wouldn't be surprised. Since my normal Cattaraugus County retail therapy dilemma is weighing up the relative attractions of Walmart and Kmart, my head is spinning. I am like a kid in a sweetshop. It's a positive cornucopia of riches, filling 90 squared and fountained acres. From Trader Joe's to Tiffany, Banana Republic to Barnes and Noble, Lego to Louis Vuitton, throwing in a Macy's, a Nordstrom's several interior design emporia and a swanky Hilton, not to mention more cafes and restaurants than you can shake a stick at. And once you've taken your life in your hands crossing the six-lane highway between the flats and the shops, (they give you just over 20 seconds, counting down menacingly) along which cars race at Indie 500 speed, you can walk everywhere with the minimum of hazard, except to your credit card. And yes your eyes are not deceiving you.. They are even geared up for Old English weather, kindly providing umbrellas. they have something of a potential hoodie problem here. In daylight, as in many such places, all is friendly, bustling prosperity, families and fun and businesspeople meeting for leisurely lunches; at night the boys and girls, given the opportunity, will come out to play. Indeed in 2011 a teenager was shot dead here, caught in a showdown between rival gangs. Stern action has been taken to preserve the Paradise; another local joked that every second shopper you see is a security guard. But as a Londoner, I can remind them that, in Old England, a Dickensian underbelly lurked beneath the charm. And in case you don't know how to get there, it's easy to find.